1) Aim high and low — When choosing railing, look for high-performance and low-maintenance materials, so that you’ll be able to spend more time relaxing on your deck rather than maintaining it. Although a classic option, wood railing requires frequent staining and sealing and is prone to rot and decay. Glass also requires a lot of upkeep, while iron is heavy and can be difficult to install. Aluminum and composite offer durable, attractive and versatile options that are easy to work with and maintain. You can never go wrong by selecting railing in the same shade as your decking, such as dark brown railing for a dark brown deck. This creates a cozy, well-coordinated look. If you have trouble finding a perfect match for your decking — or if you’re open to trying something different — consider railing in a contrasting color, such as black or white. Both are classic options that complement virtually any outdoor setting. For homeowners seeking a custom look, let the creative juices flow. Mix colors and materials, such as combining dark aluminum railing and balusters with white composite posts, to create a dramatic, distinctive design. 3) Optimize views and privacy — If you’re lucky enough to have a view beyond your deck, optimize it with aluminum railing that offers maximum strength with a minimalist style. Designed to offer all the benefits of other horizontal baluster railing designs without the hassle of maintenance, Trex Signature Rod Railing blends into the background, allowing your view to be the focal point. If scenic views are not the focus, opt for railing options that feature thicker posts and larger balusters to help enhance the privacy of your outdoor space. 4) Factor in function — One of the most popular trends right now — especially among homeowners who like to entertain outdoors — is “cocktail railing.” This design approach uses a deck board as a top rail to create a flat surface ledge at just the right height for holding drinks and plates. By using boards that match the decking, you can achieve a look that perfectly complements your home’s deck, while making great use of space. 5) Light it up — Augment the beauty of your railing and lengthen the time you can spend enjoying your deck with discrete outdoor lighting that can be integrated on railing posts and caps. Not only will lighting set the mood, it also will add safety and security. Consider LED dimmable options to maximize energy efficiency. 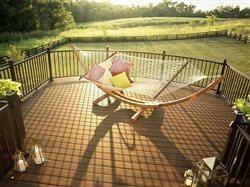 A deck’s railing adds support, safety and style. 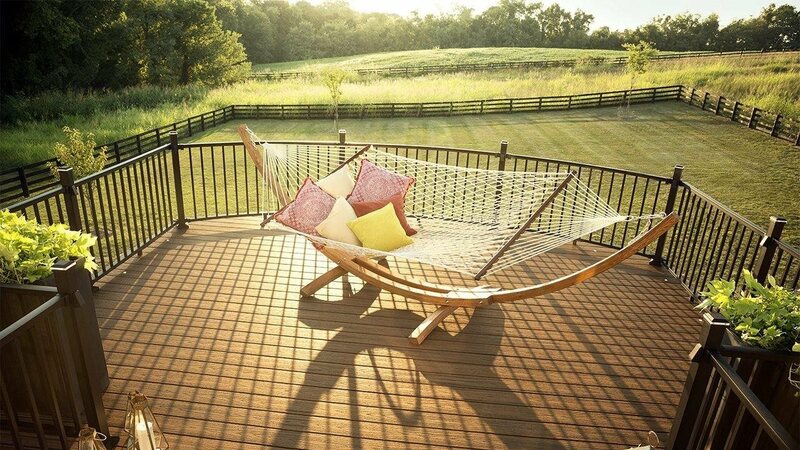 Here are five tips for creating the perfect perimeter for your outdoor space. 1. Aim high and low — Look for high-performance, low-maintenance materials, so you can spend more time relaxing on your deck rather than maintaining it. 2. Showcase your style — When selecting a railing color and style, you can coordinate with the decking material, contrast with a complementary color or get creative and customize. 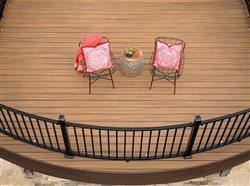 Take the guesswork out with an option like Decking & Railing Duos from Trex Company. 3. Optimize views and privacy — Aluminum railing offers a minimalistic style to make your view the focal point, while thicker railing posts enhance privacy. 4. Factor in function — Try a “cocktail railing,” using a deck board as a top rail to create a flat surface ledge at just the right height for holding drinks and plates. 5. Light it up — Integrate outdoor lighting on railing posts and caps.